Half the food wasted in the UK is thrown away at home. In total, a third of all the food produced in the world is wasted. It represents an annual value of $1 trillion and it’s one of our planet’s greatest problems. There are millions of people who don’t have enough, deforestation to create grazing and arable land afflicts ecosystems for farmers to produce too much, and animal methane gases contribute to global warming and climate change. Co-founders Tessa Clarke and Saasha Celestial-One knew each other from their MBA studies at Stanford Business School where they became firm friends. 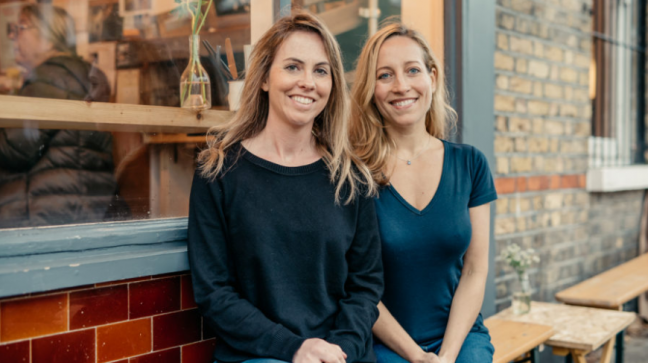 They hatched an idea to start OLIO in 2015, an app to connect neighbours with each other and with local businesses so surplus food can be shared, not thrown away. This can be fresh or packaged food nearing its sell-by date in local stores, spare home-grown vegetables, bread from a local baker, or the groceries left in the fridge when people go away. They launched the OLIO app in 2015 and now have almost 25,000 volunteers operating in over 50 countries. I met Tessa recently and she kindly agreed to share her story with me. How did you first test for public support of your idea to engage the crowd in a breakthrough solution? We carried out some market research using SurveyMonkey and we found that 1 in 3 people are “physically pained” about throwing away good food. We then set up a WhatsApp group with 12 people and found they were very enthusiastic about sharing food that would otherwise go to waste. From that we received incredibly valuable feedback and suggestions. With the support of our first investor we built the MVP (minimal viable product) version of the app. And working like crazy, exactly 5 months after we’d incorporated the company (we were Mums on a mission with no time to spare! ), we launched the app in the App Store on 9th July 2015, quickly followed by Google Play three weeks later. The very first version of the app was extremely basic, and could only be used in five postcodes in North London. But that didn’t matter, we were live and ready to bring food sharing to the world! And what’s your growth been like since those early days? We’re absolutely thrilled that we’ve now got 750,000 users plus 25,000 brand Ambassadors (volunteers) all over the world. And together they’ve shared over a million portions of food – which is the environmental equivalent of taking almost 3 million car miles off the road! How do you cope with different food safety regulations on person-to-person food exchange in all these different countries? Food safety and regulation is something we take very seriously. All the food redistribution undertaken by our “Food Waste Heroes” – who collect unsold food from local food businesses and share it via the app – is governed by an incredibly robust Food Safety Management System. And the neighbour-to-neighbour sharing is covered in our standard T&Cs. You’ve already mentioned a “first investor.” What was it like, raising funding to be able to dedicate yourselves to OLIO and make it grow? Our very first investor was Simpleweb, who are a development agency in Bristol, and they absolutely loved the problem we are trying to solve and so wanted to partner on it. That enabled us to get the first version of the app built. Since then we’ve raised three rounds of equity financing, and each one has been very different – our latest round was a $6m Series A round led by Octopus Ventures this summer. Fundraising is always challenging, but incredibly rewarding once completed. It’s been quite a sobering experience being a female-founded startup team – because only 2% of VC funding last year went to female founded startups. OLIO generates revenues by charging businesses for the service we provide via our Food Waste Heroes Programme to enable them to have zero edible food waste stores. Businesses are increasingly recognising that it’s no longer acceptable to be throwing away perfectly good food – their customers don’t like it, and their employees don’t like it either. Is there ever a clash between volunteers helping for free and the OLIO founders want to make money? Our volunteers understand that OLIO needs to have a sustainable business model, and therefore generate revenues, to be able to continue to exist and have the incredible impact we’re having. So they’ve been some of our biggest supporters as we’ve started to monetise. Your growth rate has been really impressive. What marketing have you used? Our Ambassadors have definitely been at the heart of our growth. We’ve also had some amazing bursts of new users whenever we’re featured on television, or in the App Store. Press has been useful for reinforcing the brand and credibility although it doesn’t drive immediate downloads. In terms of paid advertising, Facebook and Google have been most effective. We have an unashamedly bold ambition for the future – in 10 years’ time we want a billion people to be using OLIO. When we raised our Series A funding this summer, it enabled us to double the size of our team and so now we’re really accelerating our growth. Thank you Tessa, your story is so inspiring. If you would like sign up to OLIO and start sharing recyclable surplus food then please go to their website now to download the app.